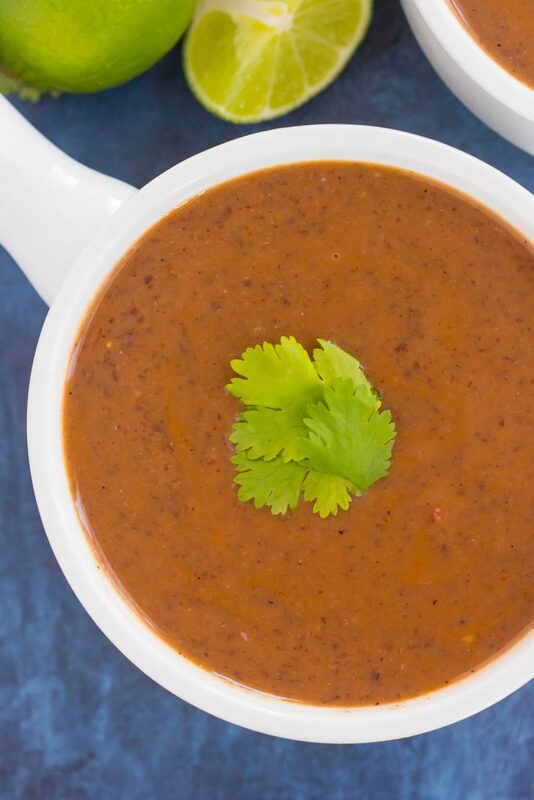 This Easy Black Bean Soup is zesty, filling, and ready in just 30 minutes. Loaded with black beans, spices, and lots of flavor, this simple soup serves as a hearty main dish and is perfect for a meatless entree! I consider myself to be a well-rounded when it comes to food. I’m not really a picky eater, or at least I think so. 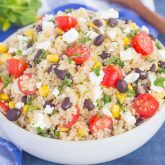 Sure, there are certain foods that I won’t touch with a ten foot pole (I’m looking at you coleslaw, cottage cheese, cucumbers, celery, and potato salads). But, for the most part, I will try everything and like most of it, too. So, it’s kind of strange to me that the first time I had black bean soup was about two years ago at a Mexican restaurant. Now, I love black beans. 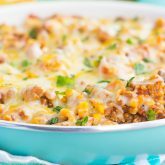 Especially in this Black Bean Taco Quinoa Skillet, that Southwest Chicken and Rice Bowl, and this Sweet Potato Chili Pasta. But, in a soup? For some reason, I had never had it before! Strange, especially for a food blogger, right? I was a little skeptical to try it, but once I did, I was hooked. And ever since then, I’ve been a black bean soup connoisseur. I’ve been on the hunt for black bean soups. Some I like, some were ok, and some weren’t worth having again. But, nevertheless, I still enjoyed them all. So, it’s time for me to share this Easy Black Bean Soup for the April installment of Thirty Minute Thursday! I will admit that I researched a lot of black bean soup recipes and had my fair share of recipe fails when trying to make this a 30 minute meal. 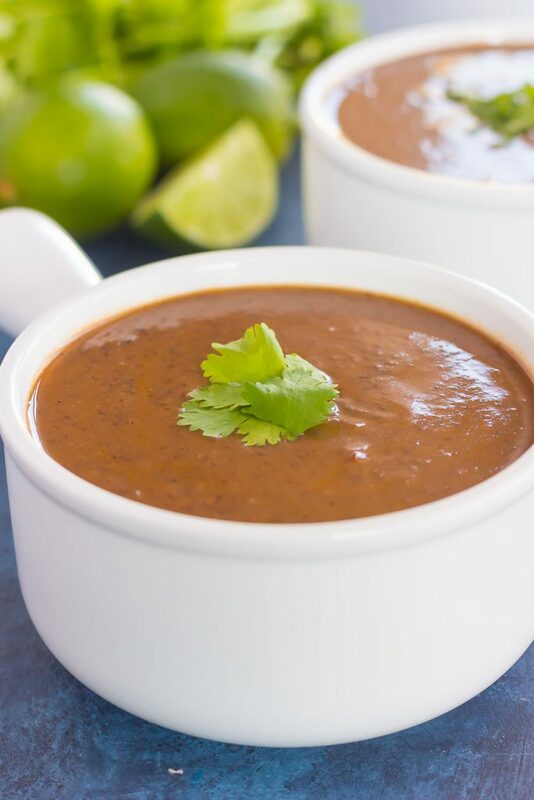 Most black bean soups that I found were either made in the slow cooker or took more than 45 minutes to make. Fine if you have the time, but since we’re talking about 30 minute recipes today, that just wasn’t going to cut it. After some trial and error, I finally perfected this Easy Black Bean Soup. It’s loaded with flavor and packed with deliciousness. The creamy texture, while still keeping some of the beans and veggies intact, makes this soup extra special. And it’s really so easy to make, friends! Hence the name Easy Black Bean Soup! If you’re on the hunt for the perfect meatless Monday dish, or are just in need of a hearty soup, then look no further. I guarantee this soup will rival the restaurant versions. If you’re really looking to save time, buy the already diced onions that you can usually find in the refrigerated section of your grocery’s produce section. That way, you don’t have to dice the onion! It’s all about texture! 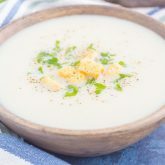 I like to puree half of the soup to create that creamy and thick texture, and leave the other half as is, which adds some chunkiness to the soup. If you prefer a smooth and consistent texture, feel free to puree the entire batch. Either way, it’s delicious! 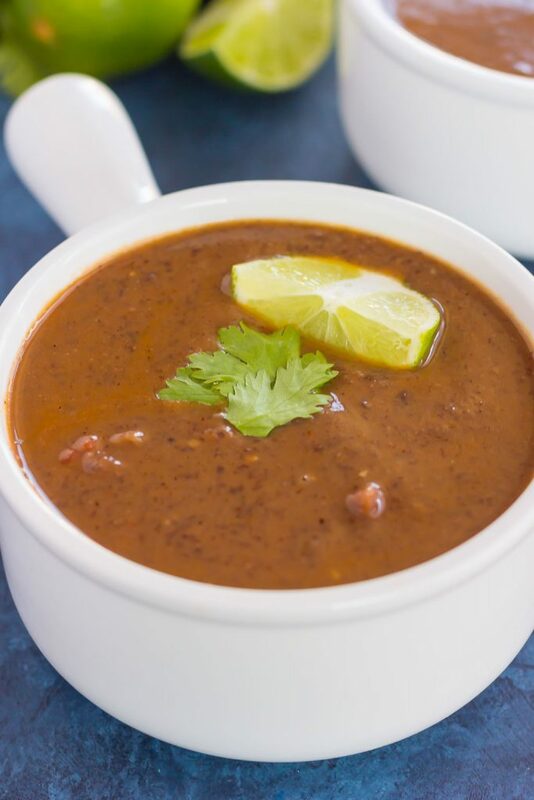 So grab those black beans and whip up this flavorful Easy Black Bean Soup! Heat olive oil in a medium soup pot or saucepan. Add onion and saute until begins to soften, about 2-3 minutes. Add minced garlic and saute an additional minute. Stir in chicken broth, Rotel diced tomatoes, chili powder, cumin, salt, pepper, and black beans. Bring mixture to a boil. Then, reduce heat and simmer for 10-15 minutes. Remove from heat. Transfer half of soup to a blender or medium bowl. Using a blender or immersion blender, blend until pureed. Pour pureed soup back into pot. Add lime juice and stir. Serve immediately and garnish with cilantro, a lime wedge, and/or sour cream, if desired. I love all the foods on your 'not touch with a ten foot pole list' lol!! I especially love cottage cheese! Once upon a time I didn't like guac or cilantro, but love both now. Hmmm....what don't I not like now? I don't think I care for snails, but that's not a far stretch to imagine and I'm sure there's other stuff, but I just can't think of. I do, however, love all kinds of beans and black beans are definitely at the top of the list! 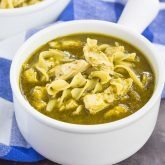 What a great soup with lots of flavour and so awesome that it can be prepped and made in 30 minutes! I bet this would be lovely with a cheesy quesadilla for dinner :) Now I'm gettin' hungry ;) Pinned! Cheers to a fabulous weekend, my friend! Haha I so wish I liked cottage cheese! I remember 'hoping' I'd like it when I was younger and took a huge scoop at someone's house, even though I knew I didn't like it! :) Thanks for the soup love, Dawn! Black bean soup is my new favorite! Sounds delicious! I love your 30-minute meals, and Black Bean Soup has always been one of my favorites at Panera. This looks so simple and flavorful! Thanks, Blair! I will have to try Panera's version! Lol! I will definitely eat all those foods on your "I won't touch with a ten foot pole" list FOR you, Gayle! ;) I'm not a picky eater, but I am a picky eater.. if that makes sense. Like, the only thing I refuse to touch is veal and ham, and then I can't touch cocoa because of my allergy. But, while I will eat everything, I won't eat a lot of it. I guess I'm not picky, but I am conscious of what I shouldn't eat a lot of. Aaanyways, I adore black bean soup! It's one of my favs and yours looks delicious! Plus you know I love your thirty minute meals!!! Pinned! Cheers, friend! Haha deal, you can take the foods I don't like, and I'll take your ham and everything chocolate! :) Thanks for the soup love, friend! I LOVE black bean soup and it's been forever since I've had it! It was so smart pureeing half and leaving the other half chunky. While I love smooth creamy soups, it seems more satisfying to me when there are chunks of beans, veggies, etc! This looks delicious Gayle and I need some for my lunch today! I LOVE black bean soup but I've never made it at home. WHY? I don't know what I've been thinking all these years, considering that ummm, I love to cook. I'll definitely have to try yours! I detest cottage cheese, too, BTW. How do people eat something that looks like that? I can't even look at it too long without dying a little inside. Have a great weekend! This is absolutely perfect for these 'still' chilly spring days! They're actually predicting flurries around us! I love black bean soup - this is happening! Haha that is so true, I didn't notice my 'c' patters of foods! :) Thanks for the soup love, Demeter! I love this! I must try it ASAP! Thanks, Annie! It's SO good! I was a picky eater when I was younger but I have definitely gotten a lot better. It's been so gloomy and rainy all week so a big bowl of this bean soup will definitely hit the spot! Looks so hearty and I'm loving all those yummy spices in here! Now that you mention it, I don't think I've ever made a black bean soup before. Although I do love them! I'll have to make this recipe ASAP. Love that you kept some of the texture in here! Thanks, Liz! I wish I would've made this sooner, it's so easy! I've actually never tried black bean soup, but it's one of those things that has been bugging me lately that I've never tried it! I love black beans and love Mexican flavours so I'm sure I'd like it, but haven't yet tried. It's happening soon - this looks amazing! 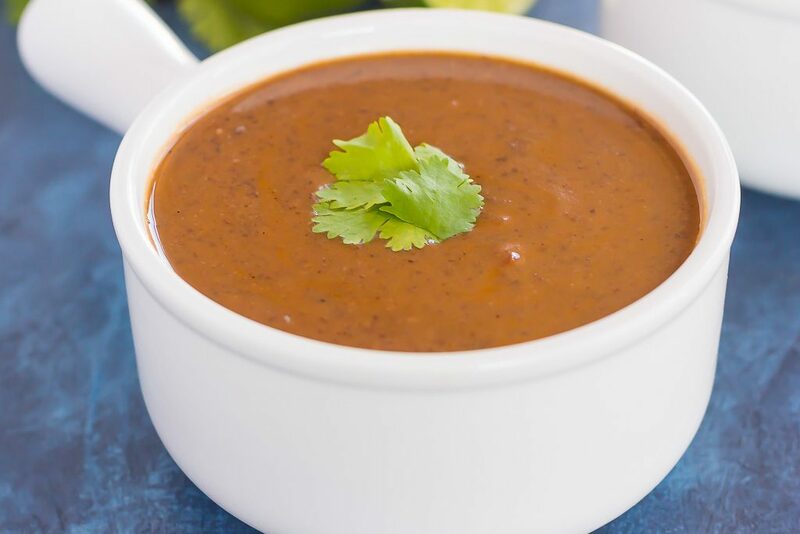 Wow, this black bean soup looks amazing! Love it! I can't believe how cold it is around here (60-s feels cold, right? ) Going to try it next week! Haha yes, 60s does feel cold! :) Thanks, Mira! Yesss to Cinco de Mayo all weekend long! :) Thanks, Kate! An easy black bean soup? Sign me up! love this! I try to prepare soups at least twice a week. Your recipe seems so finger-licking that I cannot wait to try, Gayle! Thanks for the sweet comment, Agness! This is my new favorite!